Verisk Acquires SAP’s ERC and ERD Businesses. Learn more. With the spotlight shining brightly on EHS compliance, companies are challenged to find effective ways to address the complexities and intricacies of EHS compliance management. Not only do challenges stem from a constantly-changing regulatory landscape, but from a scarcity of newcomers to the EHS field, and pressure on EHS departments to manage increased responsibility with fewer resources. Addressing these issues requires broad and deep domain expertise - expertise that doesn’t always exist within the company. And if it does, this expertise should be dedicated to driving the company’s overall compliance strategy, not bogged down with paperwork or administrative activities related to documentation, registrations, permits, fees, research of the latest regulatory changes or tracking individual country requirements. 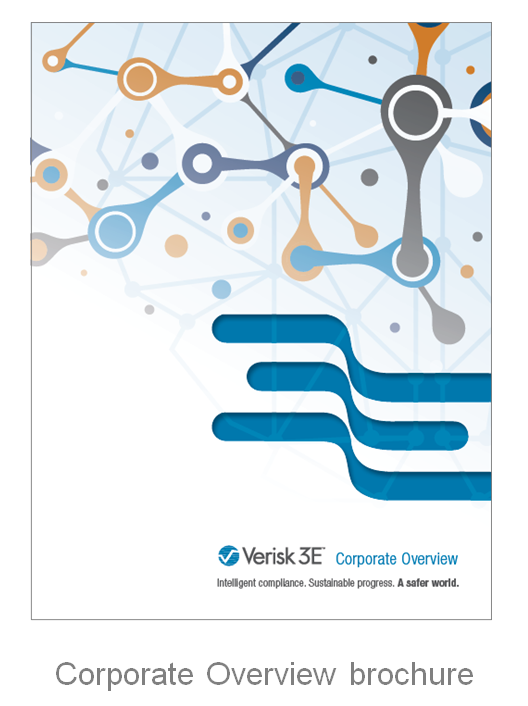 Verisk 3E provides comprehensive, one-stop solutions for content, data, tools, and services for companies that want to provide leadership and take control of their product stewardship and EHS compliance activities. Verisk 3E's products and services help companies make the transition from simply managing for compliance, to cutting-edge product stewardship practices that deliver tangible and sustainable business results throughout the organization and across the supply chain. Verisk 3E's team of professionals guide you through the necessary steps to ensure a smooth and rapid implementation and efficient, ongoing operations. This holistic approach of identifying needs, recommending specific solutions and implementing flexible, modular programs results in maximum business value by enhancing EHS staff productivity, increasing EHS cost efficiencies and providing relief from the burdensome aspects of compliance. We can help you whatever your role in the product lifecycle or supply chain. Browse our Products & Services and Solutions pages to find out how we can help or contact us today. Sign up here to receive the latest news, upcoming events, webinars and industry best practice resources. We respect your privacy. Any personal information you provide will be used for purposes only as described in our Privacy Statement. We don't share personal information with third parties. You can unsubscribe at any time. ©2019 Verisk 3E. All rights reserved.